Frontline staff of humanitarian organizations often negotiate with an array of local and international actors to establish a presence in conflict environments, ensure access to vulnerable groups and facilitate the delivery of assistance. On the occasion of the Second Annual Meeting of Frontline Humanitarian Negotiators—a gathering of 180 frontline staff as well as Geneva-based humanitarian practitioners and researchers—we asked Claude Bruderlein about current challenges in humanitarian negotiations in conflicts around the world. Claude is Director of the Centre of Competence on Humanitarian Negotiation (CCHN)—the organizer of the Annual Meeting. A joint initiative of International Committee for the Red Cross (ICRC), the United Nations High-Commissioner for Refugees (UNHCR), Doctors without Borders (MSF), the World Food Programme (WFP) and the Centre for Humanitarian Dialogue (HD), the Centre of Competence was established in 2016 to enhance professional exchanges and peer learning among frontline humanitarian negotiators. Apart from his role as Director of CCHN, Claude is also a Strategic Advisor to the President of the ICRC and lead researcher on ICRC negotiation practices. Over the past two years, you have met with hundreds of frontline negotiators from the ICRC and partner organizations, listening to their stories and discussing how to best address challenges and dilemmas in their negotiations. What are some of the key issues humanitarian negotiators face on the frontlines? During our meetings and interviews with frontline staff involved in humanitarian negotiations, we discovered that beyond the individual stories, operational contexts and personalities, there are common threads, challenges and dilemmas, as well as common strategies to facilitate humanitarian access. There is a practice of humanitarian negotiation that we can learn from. What we have learned in our research, for instance, is that lack of trust between frontline humanitarian negotiators and their counterparts—whether they are government authorities, non-State armed groups, criminal gangs or extremist groups—poses one of the greatest hurdles to negotiations. Our colleagues on the frontline are faced with counterparts that are deeply suspicious of the intentions of our humanitarian organizations. Coupled with a lack of understanding of the environment we operate in (on the part of humanitarian organizations), this lack of trust lays the groundwork for the failure of negotiations. We must also be aware of the fact that humanitarians often look at an operational context through a normative lens which defines how to conceive of the status of people (combatants, non-combatants, etc.) and situations (international armed conflicts, non-international armed conflicts, other situations of violence, etc. ); and, accordingly, start to behave according to a lens that may not resonate with counterparts on the frontlines. Their own lenses may be that of ‘jihad’, of ‘the rejection of foreign intervention’ or ‘occupation’. The disconnect between the different lenses creates problems and misunderstandings. There is of course a host of other factors that further add to the difficulty of humanitarian negotiations: the fragmentation of counterparts, the radicalization of groups, political fractures, power imbalances, among many others. But these factors are a given. There is little humanitarian negotiators can do about them; whereas the distrust and lack of understanding of the context have a lot more to do with ourselves and our organizations—and there are lessons to be learned. 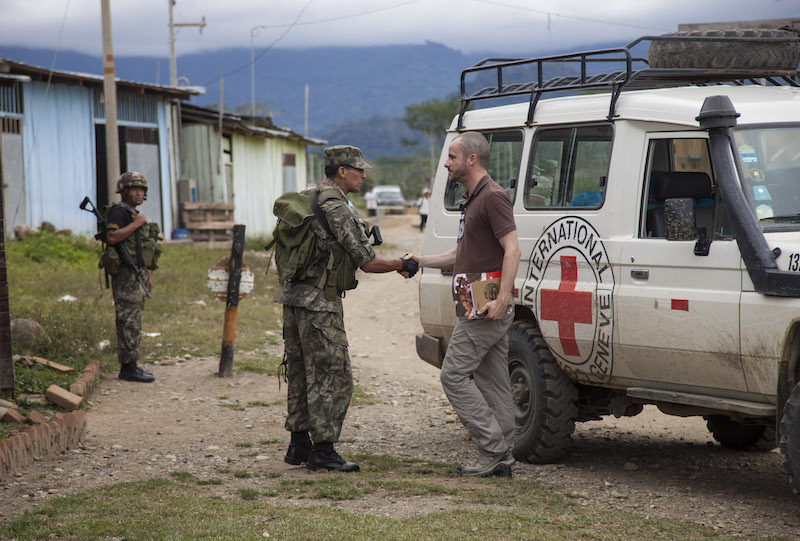 We have learned that ICRC’s long-term presence in certain operational contexts, for example, acts as a key enabling factor for humanitarian negotiations. Its long-term presence often gives the ICRC an edge over organizations that join at a later stage, as it is better connected with influential networks, has a better understanding of the situation and is more trusted by counterparts. But it is not just the long-term presence of an organization that is crucial, it is also the resources that are allocated for context analysis and actor mapping, as well as the availability of delegates whose essential task is to network, to build trust, to understand the situation and to translate this understanding into vocabulary and categories that the organization understands. In our research, we have identified these factors as important enablers for effective humanitarian negotiations. Are you able to provide a concrete example of a humanitarian negotiation and the lessons that could be drawn from it? As part of the ICRC’s Humanitarian Negotiation Exchange (HNx) project, we have analysed dozens of humanitarian negotiations in operations around the world. Now, the problem with these examples is that they need to be decontextualized. The specific lessons learned in a case are, of course, confidential. What we can do for learning purposes, however, is mixing cases where challenges were comparable and build a fictive case around them. These fictive cases can then be used in trainings and workshops to allow other negotiators to learn from past experiences. We can also compare cases based on specific types of circumstances, such as humanitarian operations where a frontline is crossed to access populations under siege. When you take a closer look at humanitarian negotiations conducted by the ICRC during the Second Battle of Falluja in 2004, for example, you quickly find similarities with negotiations during the ‘liberation’ of Sri Lanka’s Vanni region in 2008. While the operational contexts were obviously different, the problems negotiators faced on the ground, as well as the behaviour of the parties, were similar. In these and other cases of cross-line operations, we learned, for example, that in the immediate aftermath of a cease-fire that was established to allow for a humanitarian corridor to be opened, hostilities don’t just resume. Hostilities tend to intensify massively in the exact perimeters of the corridor. When provided with an opportunity to organize a convoy through such a corridor, negotiators need to have an acute awareness of the risks an escalation of hostilities might pose and consider consequences for vulnerable populations they are trying to help. In every-day negotiations in the business world and elsewhere, each party typically has to give at least something in exchange for reaching their overall objective. Yet, humanitarian actors are bound to abide by principles that are not negotiable. How do humanitarian negotiators reach compromises without compromising their principles? Negotiators on the frontlines do not negotiate humanitarian principles such as neutrality, impartiality and independence. The objective of their negotiations is to obtain humanitarian access and enhance protection of vulnerable populations. There is no transaction about principles. Having said that, there are often practical compromises that, to an extent, appear to divert from certain principles. Let’s again take the example of delivering assistance to populations inside a besieged area. A party to a conflict will typically want the ICRC to provide a fraction of assistance to the population outside of the sieged area, which—while not being the ICRC’s priority at that point in time—is of course also affected by the war. Since this party controls access, it is simply not practical to be oblivious to their needs when crossing their check-point. To ensure the legitimacy of the negotiating party, a fraction of this assistance will have to go to the population living outside of the sieged region, even if they are less affected than those inside. This is one of the most common pragmatic arrangements around impartiality. While it can be considered a case of impartiality being ‘compromised’, it is not to an extent that an operation is no longer impartial. It’s simply the means to deliver to those most in need. The extent to which you are perceived as neutral is also subjective. If a party considers that by having a protected emblem, such as a Red Cross, on a car an organization is taking a side in a conflict, well a negotiator representing that organization might agree to remove the emblem because it represents a security risk. Again, this is a diversion from the normal modus operandi, but it’s a compromise that is sometimes necessary to assist those most in need. Another central topic of this year’s Annual Meeting was the interplay between humanitarian negotiation and political mediation. What kind of interactions and interdependencies are there between humanitarian negotiators and political mediators? We chose this topic precisely because of the increasing interconnections between the political and humanitarian fields. In protracted armed conflicts, political mediation efforts are often not so much about a political process of peace-making, but about stabilization, which has a humanitarian dimension. At the same time, humanitarian negotiators engage with communities to limit violence so as to allow access and facilitate delivery of assistance, which, to an extent, is a political process as well. We have also seen political mediators in countries like Syria, Yemen or Iraq trying to arrange negotiations between the parties about conditions for humanitarian assistance, the timing of humanitarian assistance, and so on. As a consequence, reciprocity—which is not a humanitarian principle but a key concept in mediation—has almost become a condition for access. This has created a precedent whereby humanitarian negotiators can hardly get access unless they agree to respect the principle of reciprocity in their response. In other words, aid is not provided solely on the basis of needs, but also taking considerations of reciprocity into account. This heightens the risk of humanitarian aid being instrumentalised for political or military gain by the party that controls access. The exclusivity of the two fields is therefore cracking. While the objectives of the two are clearly distinct, operational environments are such that humanitarian negotiators and political mediators must be aware of their respective missions and objectives. Mutual understanding has never been more critical and by bringing together 180 representatives from both fields—including high profile mediators such as UN Special Envoy for Syria Staffan de Mistura and NRC Secretary-General Jan Egeland—we have managed to kick off this conversation in an informal manner. Without a proper dialogue between these two professional circles, we are bound to make mistakes, deviate from standards of practice and allow for misunderstandings. Claude Bruderlein is Director of the Centre of Competence on Humanitarian Negotiation (CCHN), a Strategic Advisor to the President of the ICRC and a lead researcher on ICRC negotiation practices. Thank you for this initiative. This should be a must module in the integration courses.